James Beard. ESPYs. Teen Choice. It doesn’t matter in which field you work, there’s likely an awards program for your industry. Simply submitting an entry can play an important part in your business. But the benefits are even greater if you win the big prize. And let’s be honest. It’s great to be recognized for your hard work. 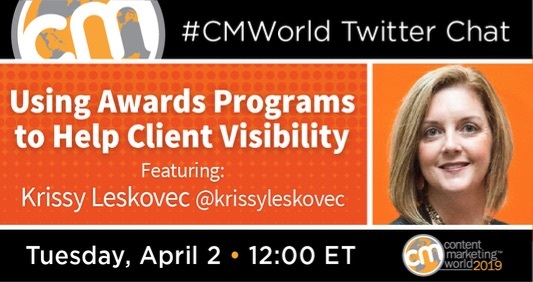 Content Marketing Awards Consulting Manager Krissy Leskovec joined a recent #CMWorld Twitter chat to explain the entry process and why it is well worth the time and effort for brands. Our discussion touched upon how award programs can get you noticed by prospective clients, how feedback from judges can strengthen your future content marketing strategy, and much more. We have a brief recap here. But if you’d like to see more of our Q&A with Krissy, be sure to check out our Twitter Moment. Are marketing awards programs more appropriate for B2B brands over B2C and non-profit ones? Would entries differ for enterprises and small business? A1: There is a misconception that marketing awards are only for big brands, B2C over B2B over non-profit organizations and individuals. Winning or even shortlisting for an award shows expertise in your field while demonstrating your quality of work. How can an award help support business goals? Have you produced content you are really proud of? Share it with us in the comments below. Content Marketing Award winners represent work from some of the most respected brands, agencies, and publishers from around the world. It’s your time to shine. Submit an entry. But hurry, the April 26 deadline is fast approaching!